A half-acknowledgment is a way of keeping a person talking by giving him the feeling that he is being heard. Purpose: To acquire the skill to encourage someone who is talking to continue talking. It is not uncommon to communicate with someone who has apparently finished talking but hasn’t really completed saying what he intended to say. Consequently, you could acknowledge him before he has completed and end up chopping his communication. In instances such as this, you have to be alert and observe when the person has more to say and not only let the communication flow to its complete end, but encourage the person to continue talking so he can actually complete his communication. You may, for instance, find yourself in a conversation with someone and want him to continue talking because you want to know more about what he is saying. The use of a half-acknowledgment is a method to encourage this. Commands: The coach reads lines from Alice in Wonderland, omitting “he said’s,” and the student half-acknowledges the coach in such a way as to cause the coach to continue talking. The coach should give partial statements that would require a half-acknowledgment from the student. The coach repeats any line he feels was not half-acknowledged. Training Stress: Teach the student that a half-acknowledgment is an encouragement to a person to continue talking. Curb overacknowledgment that stops a person from talking. Teach him further that a halfacknowledgment is a way of keeping a person talking by giving the person the feeling that he is being heard. 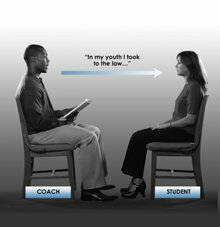 The student nods or gives half-acknowledgments in such a way as to cause the coach to continue talking. The student must not use direct statements such as “go on” or “continue” to accomplish his purpose. Smiling, nodding and other means are employed. The coach must feel persuaded to continue to talk. Any positive acknowledgments that would end off the communication flow and any failure to look or act in a manner that invites the coach to continue to talk are flunked and the drill is started again. Patter: The coach says “Start,” reads a line and says “Flunk” every time the coach feels there has been an improper halfacknowledgment. The coach repeats the same line each time after saying “Flunk,” until the student gives a proper half-acknowledgment. “That’s it” may be used to terminate for discussion or terminate the drill session. If the drill session is terminated for discussion, the coach must say “Start” again to resume it. The drill is passed when the student is confident that he can cause at will another person to continue to talk.